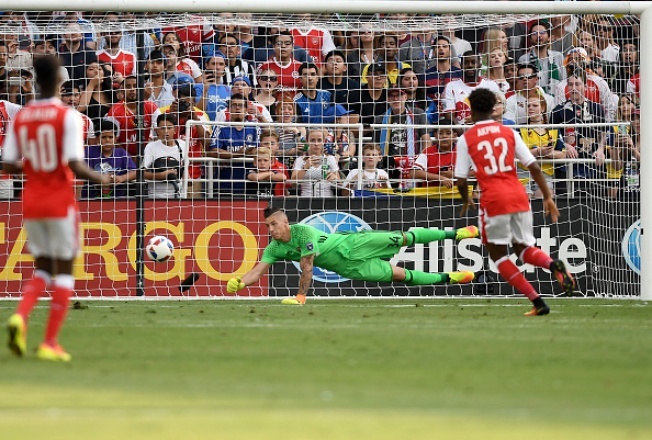 The Major League Soccer All-Stars lost 2-1 to England's top club, Arsenal, on Thursday night at Avaya Stadium. But the outcome of the match held little relevance compared to what the experience meant for a couple of Bay Area natives. Chris Wondolowski and David Bingham, both members of the host San Jose Earthquakes, said it was a special night for them. "Being an all-star is an honor; being able to play it in your home stadium is even better and something very few guys get to do," said David Bingham. "So I was very fortunate." Wondolowski couldn't have agreed more. "You look at the stadium and what they've done to bring back MLS in the Bay Area," he said. "I think it just shows what this whole community has really done for soccer in the area." The teams played even for a good part of the match until Chuba Akpom scored the late winner in the 87th minute for Arsenal, of the English Premier League. MLS All-Star coach Dominic Kinnear, who grew up in Fremont, was equally moved by having the match in his hometown area. "As a kid, I went to Earthquakes games," he said. "I've been lucky enough to be a fan and player a coach. And now to coach the best in the MLS in this wonderful new stadium, it's a great story, and I'm glad to be part of it."